Welcome to the online home of Audio Visual Facilities Limited, one of the UK’s leading Audio Visual Installers. As experts in the supply and custom installation of an extensive range of the most technologically advanced audio and visual home cinema equipment, our professionally trained CEDIA® (Custom Electronic Design & Installation Association) accredited staff offer a complete design, sourcing and installation service for residential, commercial and business environments. With over 25 years experience as Audio Visual Installers, we continuously research the latest products available in the marketplace. Our partnerships with leading audio and digital manufacturers and suppliers such as Samsung®, Sony®, Sonos® and B&W® allows us to provide a wide range of Blu-ray players, Amplifiers/AV Receivers, Speakers, Subwoofers and Mini Theatre systems for a superb cinematic experience. Whether you are looking for a 4K or Ultra HD Blu-ray Player for the ultimate in picture quality, or the latest Amplifiers/AV Receivers or Mini Theatre systems producing uncompromising cinema sound, why not take advantage of the advice and expertise of our enthusiastic AV specialists. 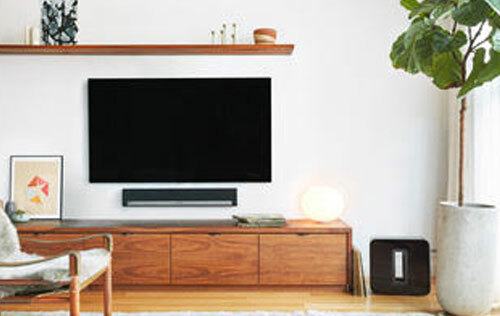 Our bespoke services encompass AV installations that maximise home space with concealed wiring for ceiling speakers and surround sound installation, together with wall/flush mounting of a 4K QLED or OLED TV. THX/ISF video calibration will also enhance the picture quality. 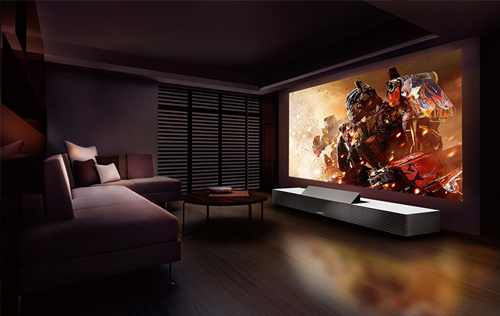 For the ultimate home cinema experience our amazing range of Sony® Projectors with 3D and 4K images will astound you. Take full advantage of 4K and Ultra HD technology by asking us to install Sky® and a Satellite Dish or a Freeview® or Freesat® box will also enhance your viewing experience. In addition to this, for the home or conference facility we can also provide state of the art projection equipment with associated digitally enhanced audio equipment and cinema seating. To complete this cinematic experience our Electrical Engineers can install a bespoke or programmable Lighting system. For the security conscious, our security experts are on hand to offer advice on programmable Door Entry Access systems or the latest Intruder Alarm systems from Eaton Security and Scantronic that can be linked to a mobile app. For both commercial and home environments Visualint® and Hikvision® CCTV systems with IR day/night Cameras provide incredible 4K picture quality up to 100 metres. Wirelessly networked to a TV, a computer screen or an android or apple compatible device, your premises can be constantly monitored either in-house or remotely. Combine this with an expertly fitted external lighting system and security concerns diminish. 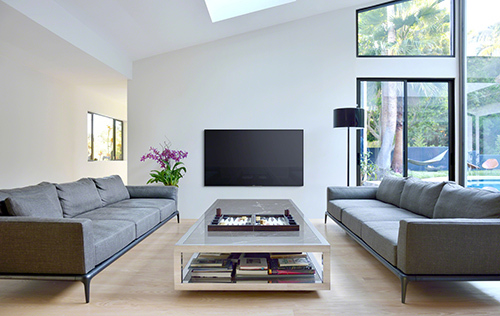 Our CEDIA Professional Systems Integrators also install an impressive range of Samsung® 4K QLED TV’s, OLED TV’s and Mirror TVs from NEOD® including In-wall Crystal framed Mirror and Bespoke TV solutions that combine luxury with Loewe LED technology. The amazing 100% customisable screens from ad notam® featuring unique direct on glass fitting; are suitable for virtually any environment including wet area applications. 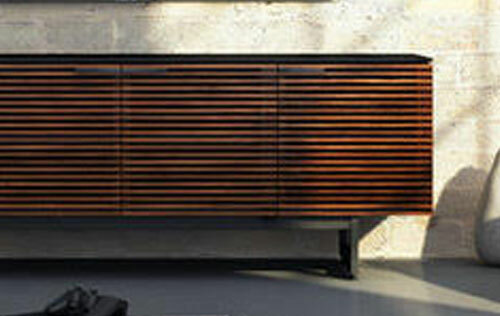 Complement your home cinema system with a perfect piece of AV Furniture from BDi® featuring innovative solutions and timeless furniture design. As Sonos® approved Installers we are also pleased to offer mind-blowing sound from the extremely versatile Sonos® Wireless HiFi System. Stream all the music on earth using your iTunes® library, Deezer®, Spotify®, Amazon® or Apple® Music and thousands of free radio stations worldwide. Controlled by Android™, smartphone, iPhone® or iPad® take advantage of the most up to date technology on the planet.